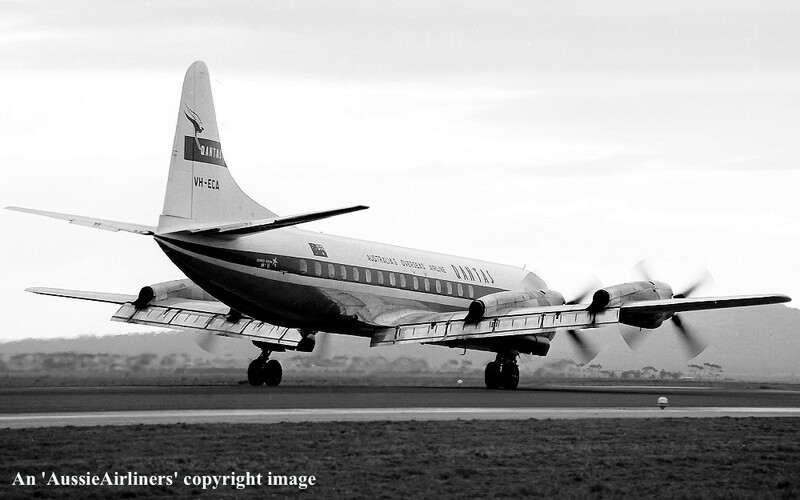 VH-ECA. 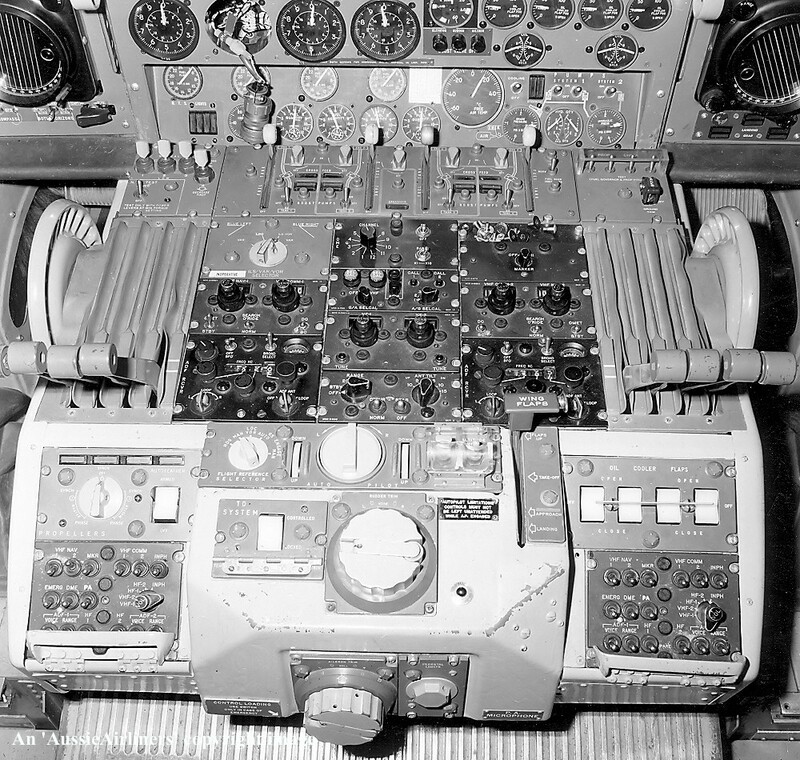 Lockheed 188C Electra. c/n 2002. 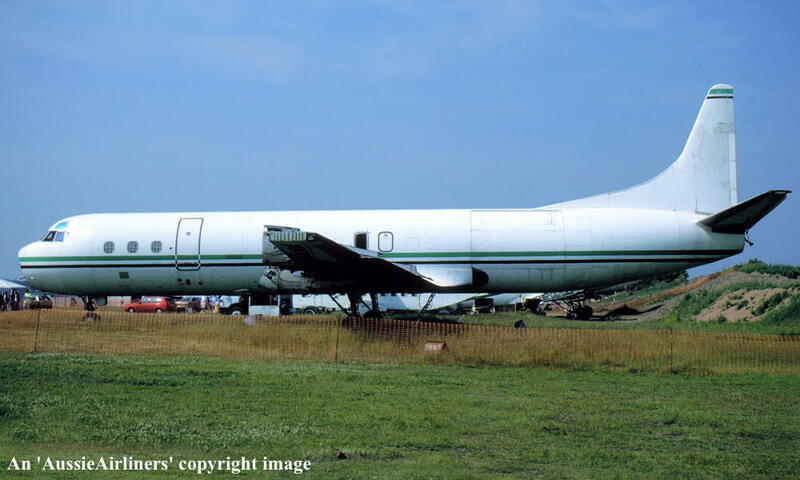 Entered onto the Costa Rica Aircraft Register as TI-LRM - ? 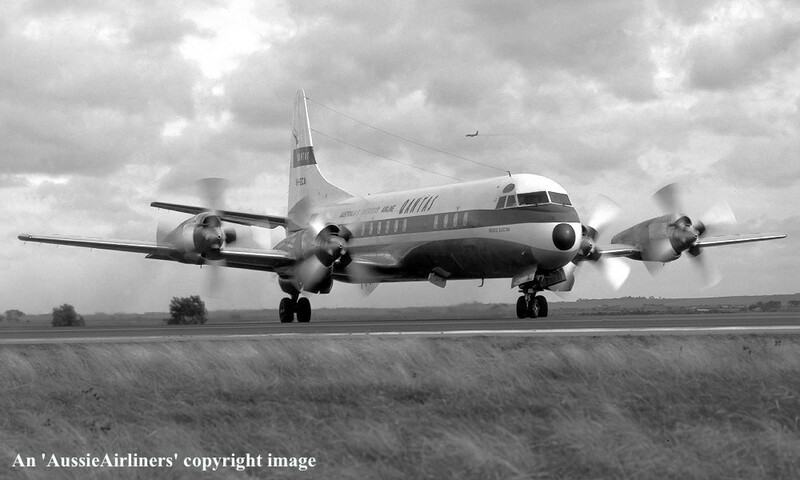 Cancelled from the French Aircraft Register - ? VH-ECA. 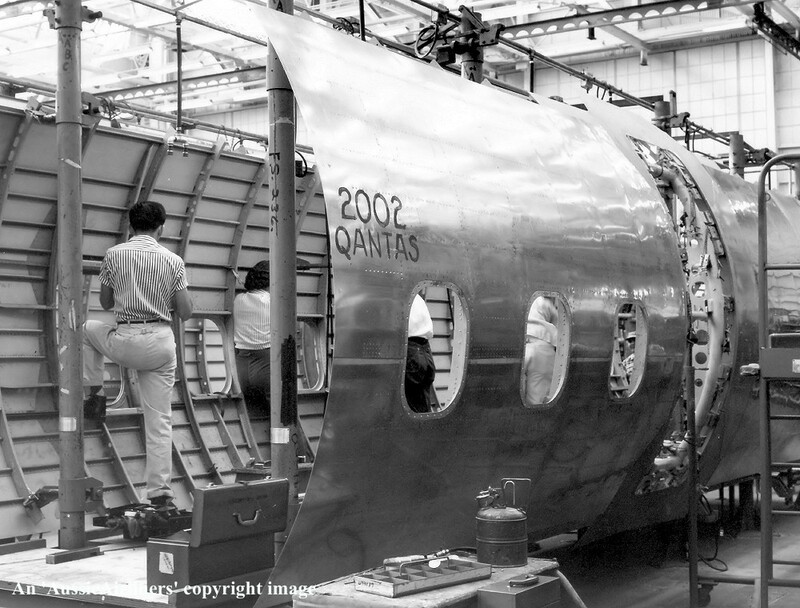 Qantas Australia's Overseas Airline - at the Lockheed Burbank Plant, April 1959. 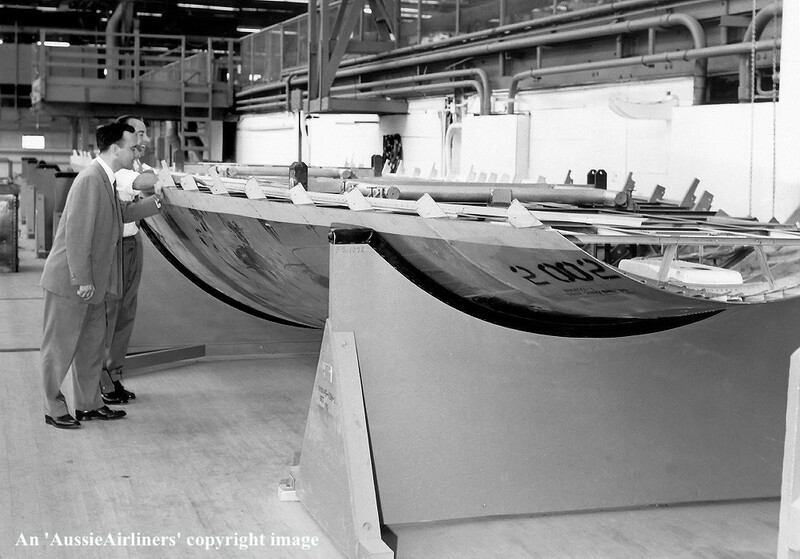 Phil Jost and Bill Thomas (Qantas Engineers) inspect the keel during construction. 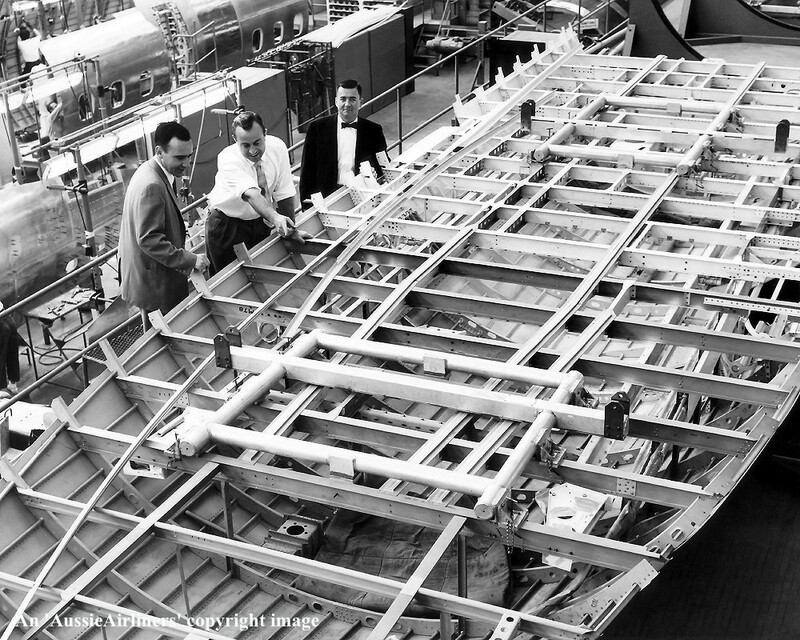 Phil Jost, Bill Thomas and Clint Banik inspect the keel during construction. VH-ECA. 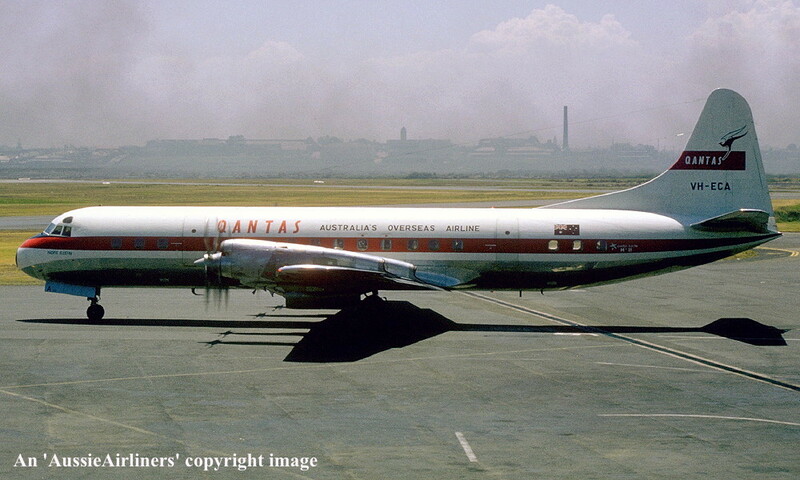 Qantas Australia's Overseas Airline - in the original livery at the Lockheed Burbank Plant, June 1959. VH-ECA. 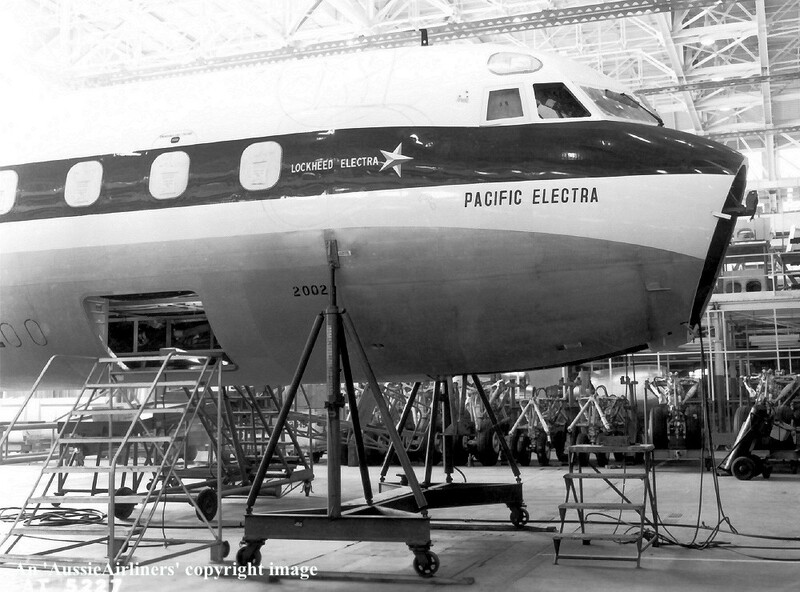 Qantas Australia's Overseas Airline - 'Pacific Electra' in the original livery at the Lockheed Burbank Plant, April 1959. 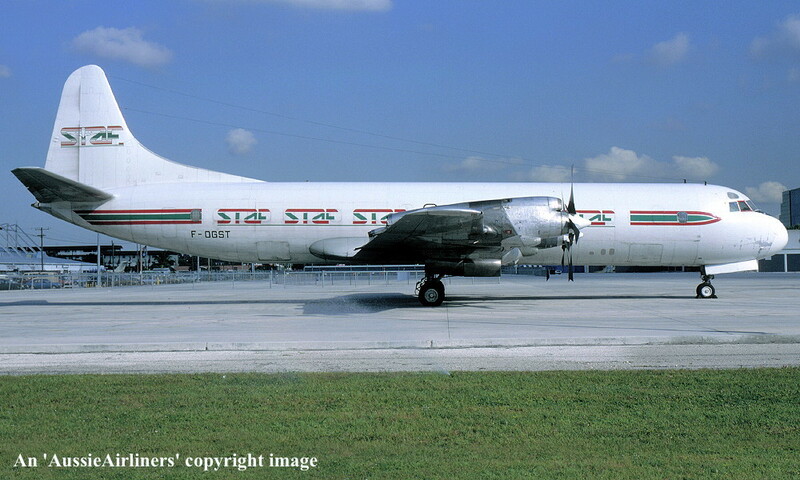 The 'Lockheed Electra' titles and the Lockheed 'star' were deleated from the aircraft at a later date. VH-ECA. 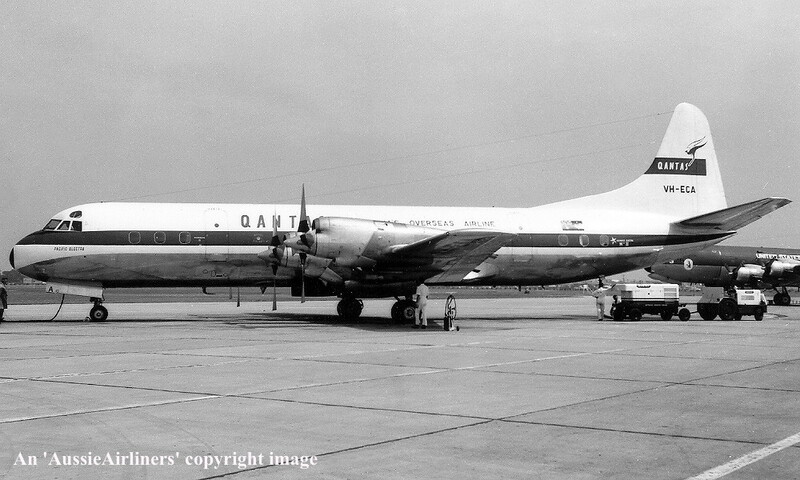 Qantas Australia's Overseas Airline - 'Pacific Electra' in the original livery after roll-out at the Lockheed Burbank Plant, October 1959. 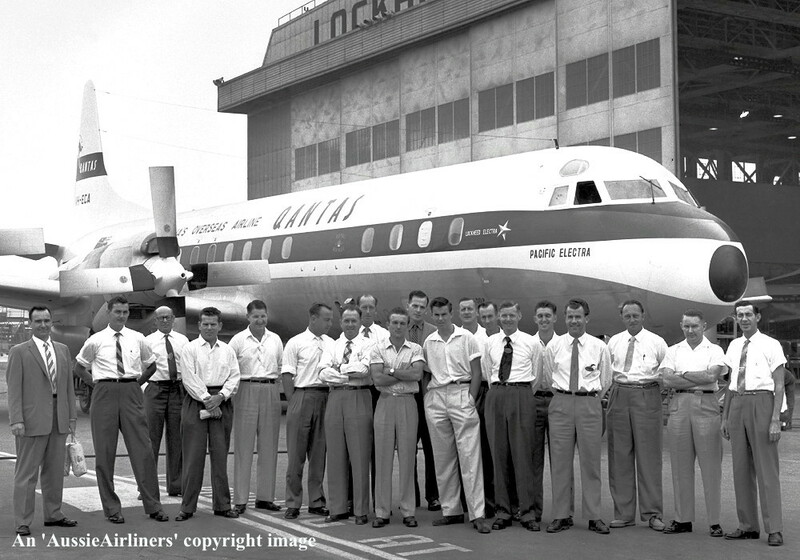 Present for the event from left to right: Phil Jost (Resident Qantas Engineer); Norm Heppel (Production Inspector); Frank Ward (Production Inspector); Gordon Hall (Foreman); Rolly Hill (Foreman); Bill Thomas (Production Inspector); Don Hollebon (Service Engineer); Keith Hancock (Sub-forman); Bill Pearce (Route Statetion Engineer); Ian Paton (Route Station Engineer- BOAC); Gordon Smith (Route Station Engineer); Jim Sumner (Route Station Engineer); Mick Litherland (Route Station Engineer); Bruce Scott (Systems Engineer on course at Lockheed); Norm Smith (Route Station Engineer); Don White (Route Station Engineer); Alan Woods (Sub-forman); Russell Eyres (Route Station Engineer); Denny Cary (Production Inspector). VH-ECA. 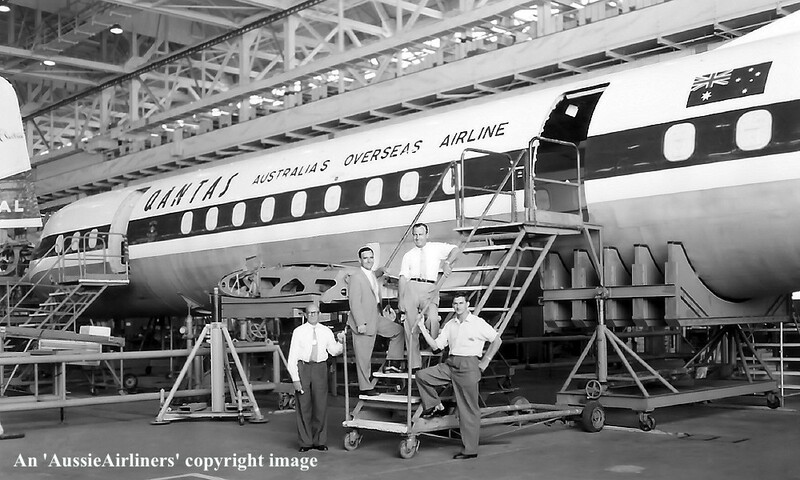 Qantas Australia's Overseas Airline - 'Pacific Electra' in the original livery on hand over at the Lockheed Burbank Plant, November 1959. 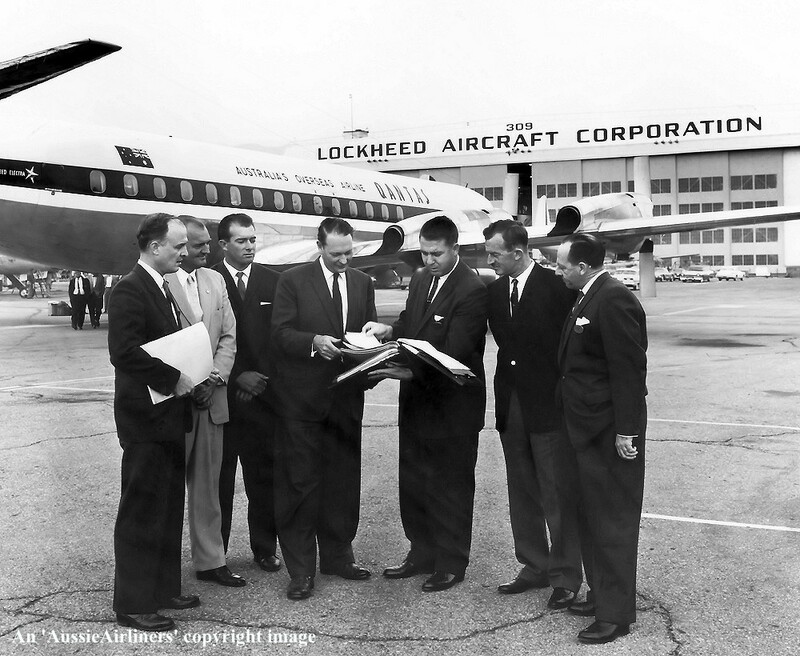 Present for the event from left to right: R. H. Stevens (Resident Engineer, Burbank); J. Doldissen (Production Inspector); R. Traynor (Engineer Officer): Captain K. W. Nicholson (Qantas); R. J. Yates (Technical Manager, USA): C. Halliday (Qantas First Officer): K. Weddell (Acting Procurement Supt, USA). 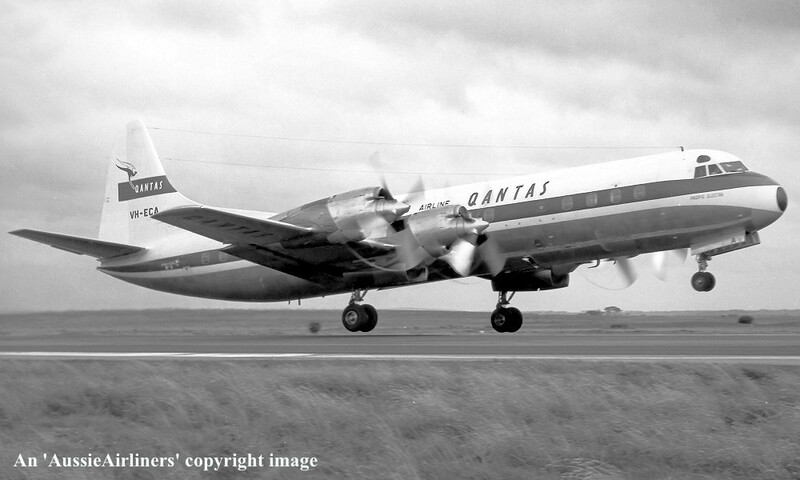 VH-ECA. 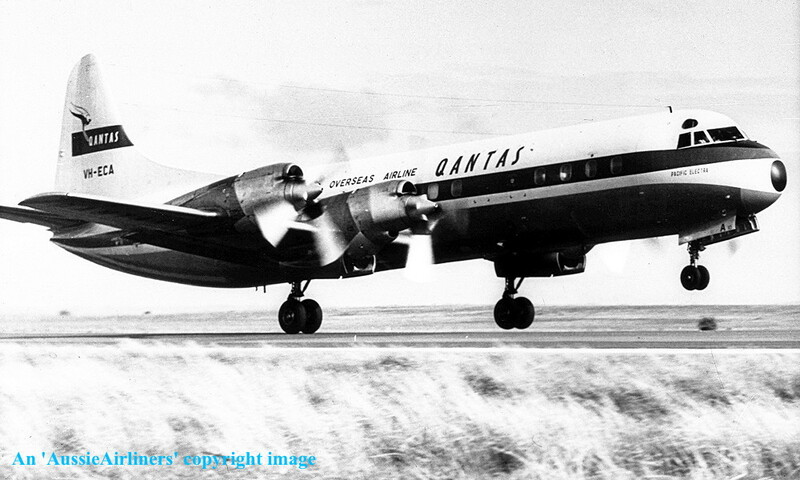 Qantas Australia's Overseas Airline - 'Pacific Electra' in the revised livery at an unknown airport, October 22, 1962. VH-ECA. 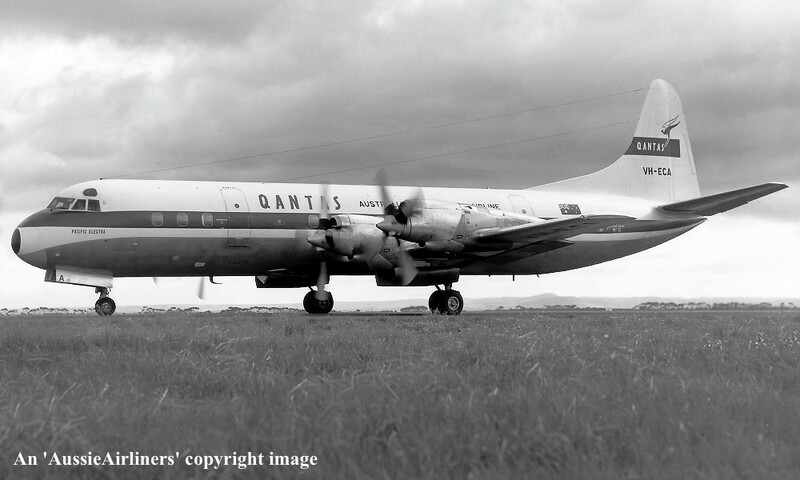 Qantas Australia's Overseas Airline - 'Pacific Electra' in the revised livery at Melbourne Avalon Airport, June 1964. VH-ECA. 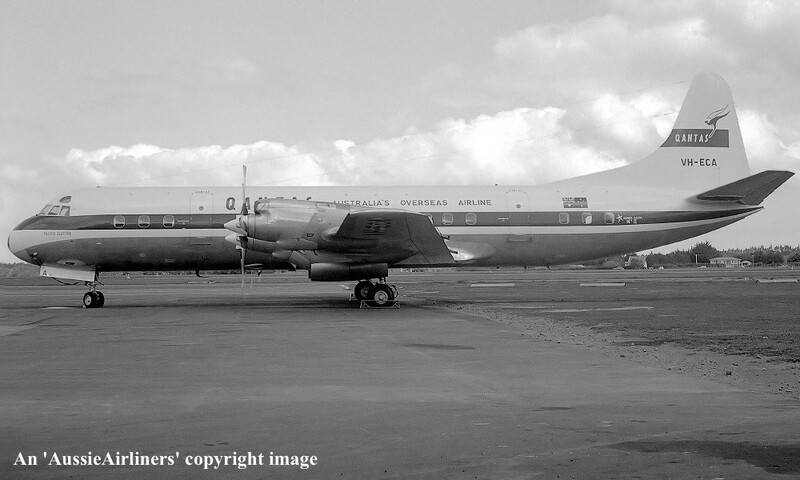 Qantas Australia's Overseas Airline - 'Pacific Electra' in the revised livery at an unknown airport, date unknown. VH-ECA. 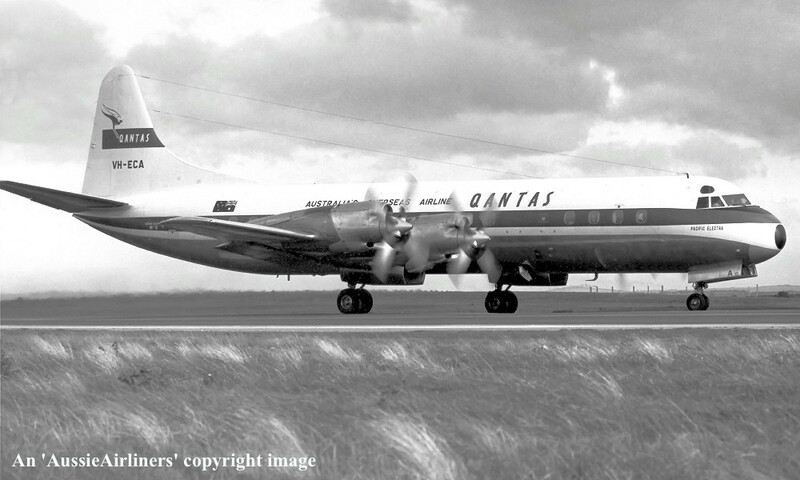 Qantas Australia's Overseas Airline - 'Pacific Electra' in the revised livery at Sydney Kingsford Smith Airport, circa 1965. 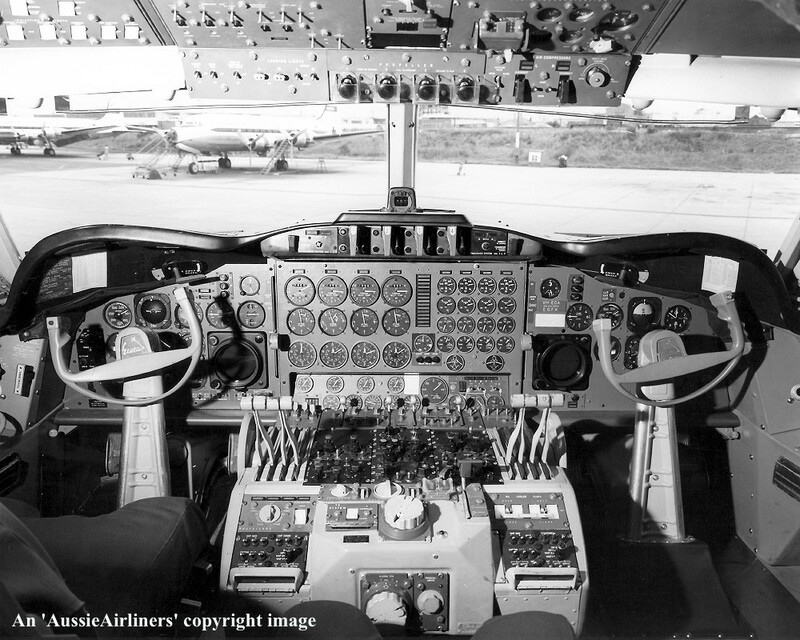 This is the pilot's side instrument panel. 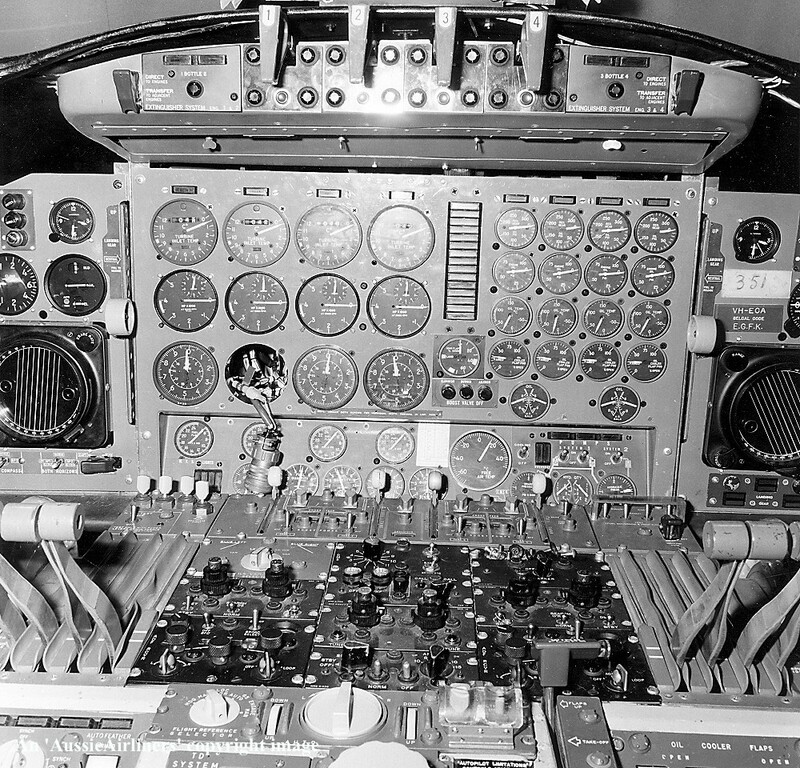 This is the co-pilot's side instrument panel. 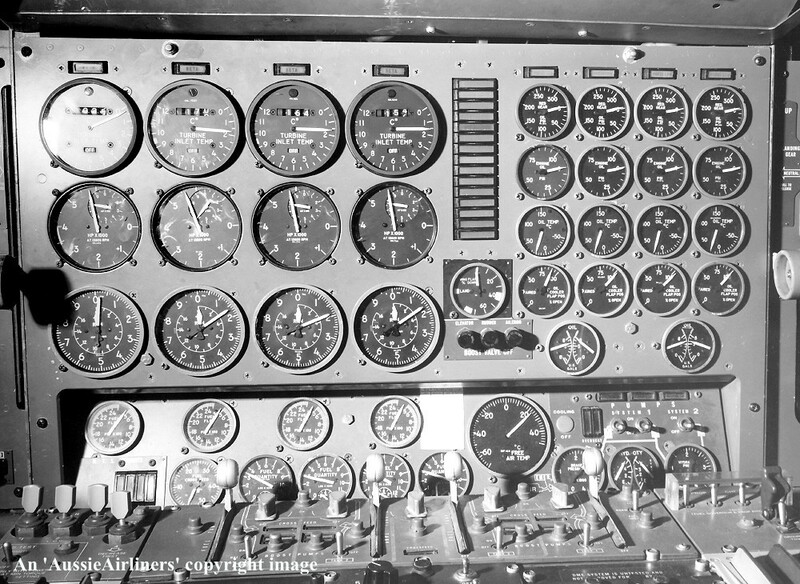 This is the centre instrument panel containing the engine instruments. 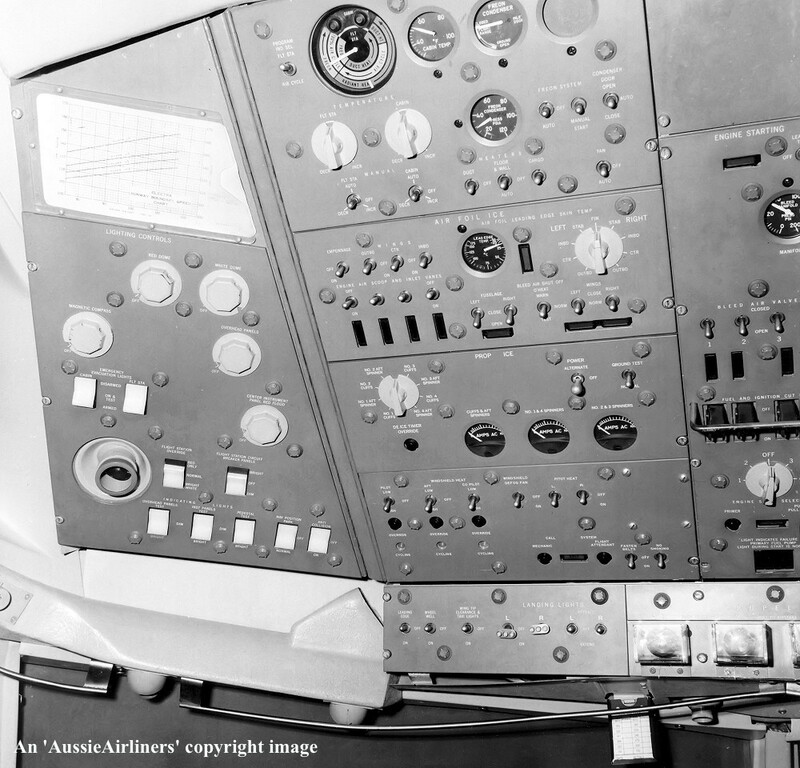 This is the engine instrument panel. This is the centre pedestal panel. 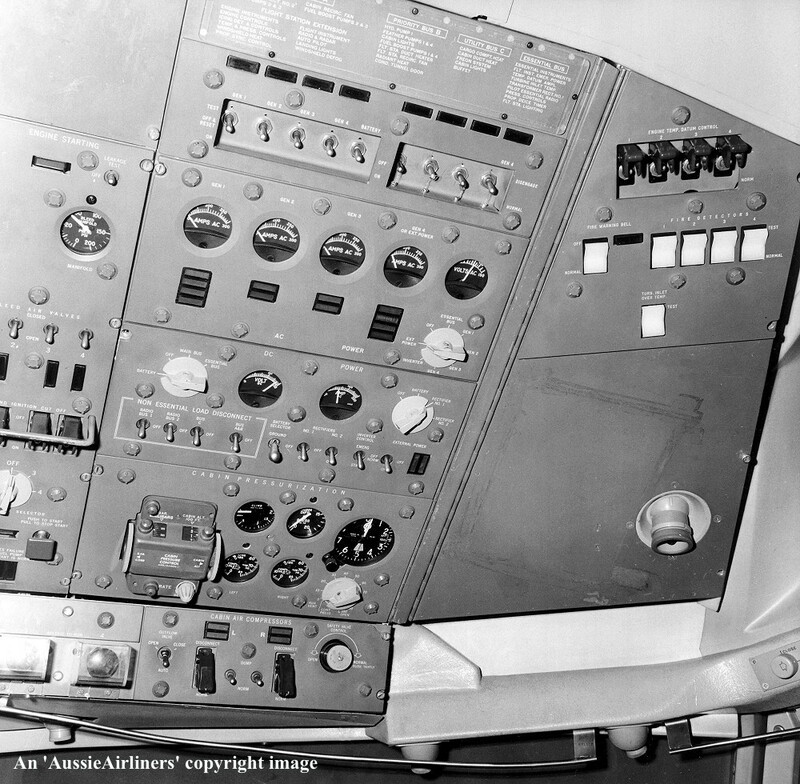 This is the communication panel on the co-pilot's side. 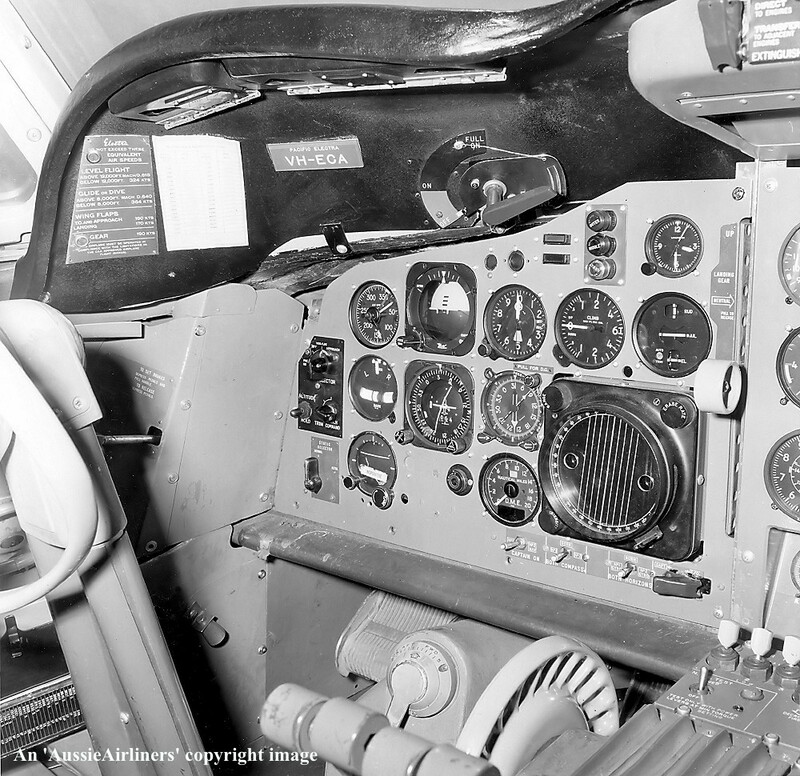 This is the pilot's overhead instrument panel. 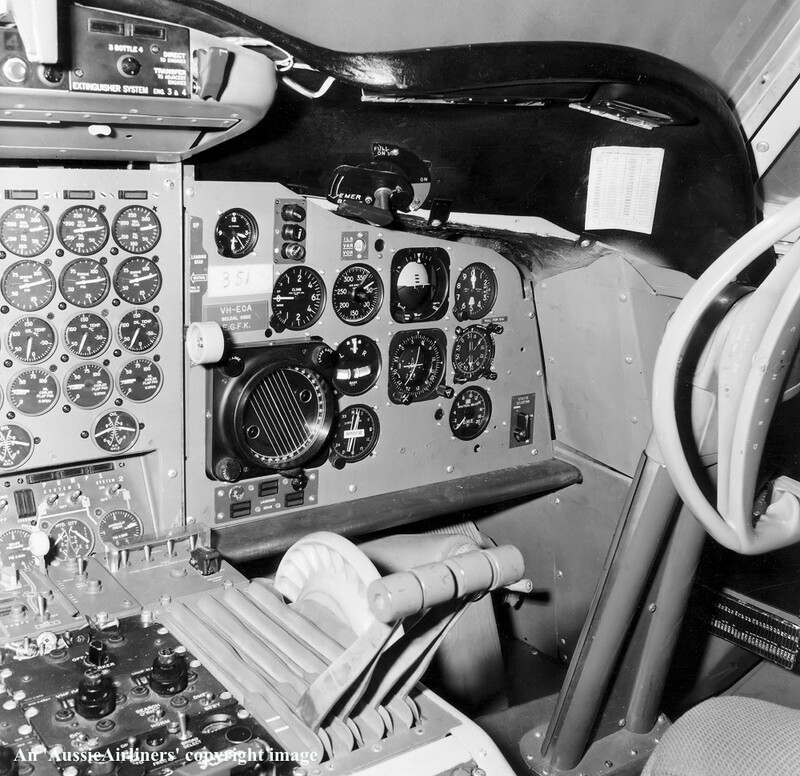 This is the co-pilot's overhead instrument panel. 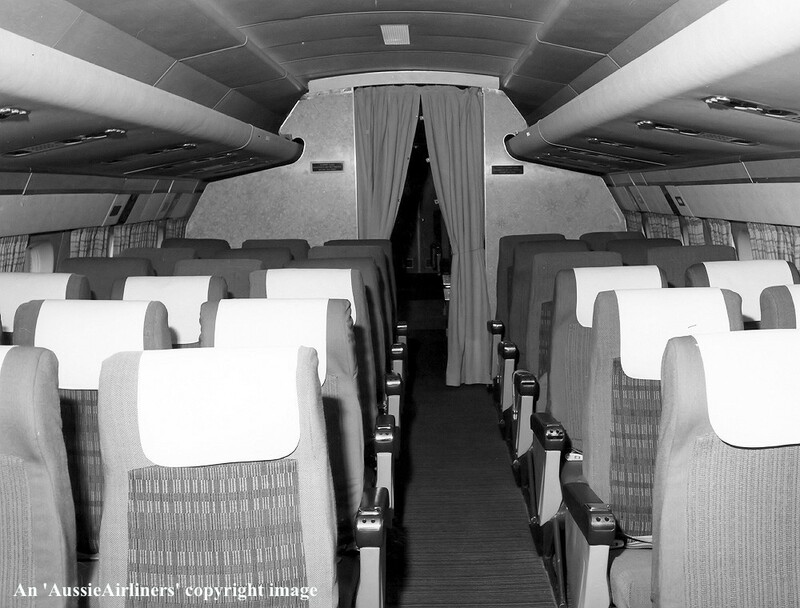 This is the economy class cabin. 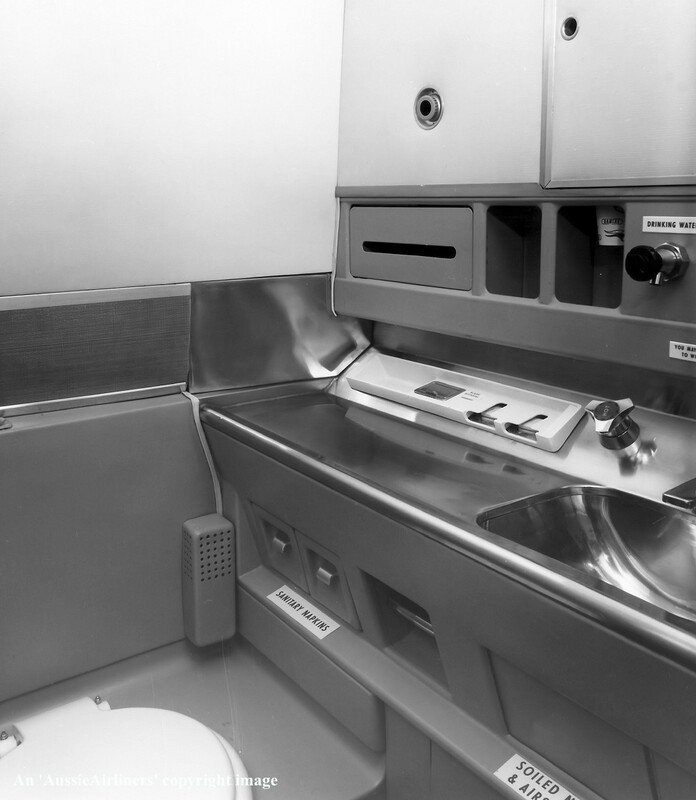 This is one of two rest rooms situated at the rear of the aircraft. VH-ECA. 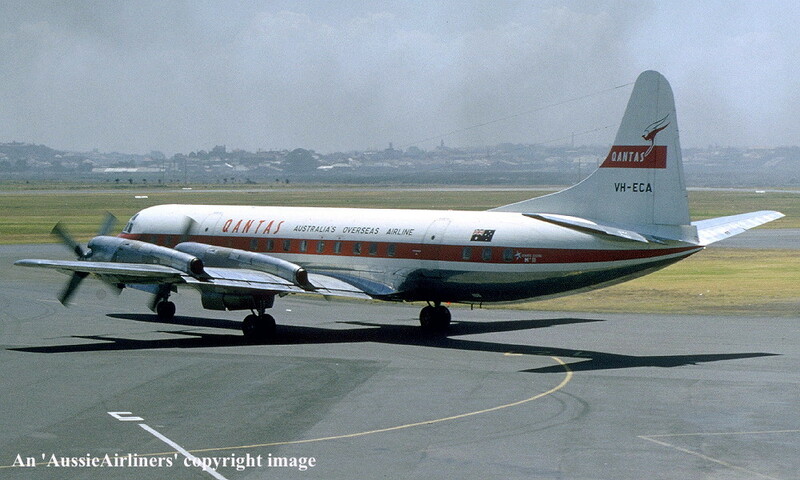 Qantas Australia's Overseas Airline - 'Pacific Electra' in the revised livery at Sydney Kingsford Smith Airport, December 1966. VH-ECA. 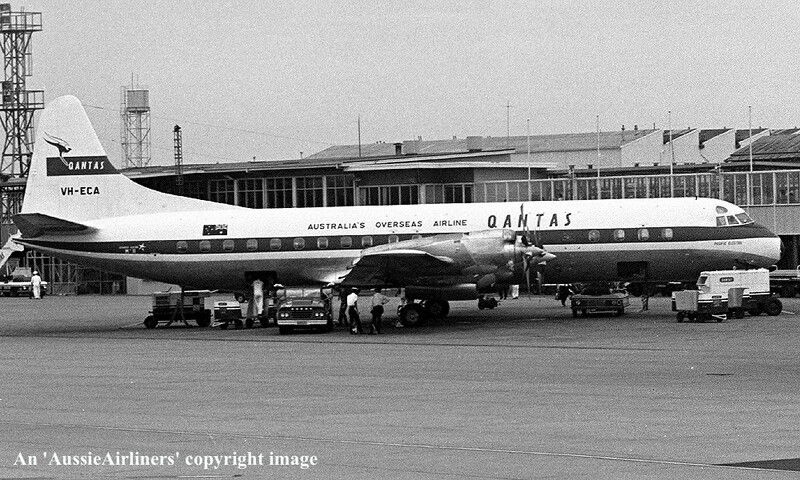 Qantas Australia's Overseas Airline - 'Pacific Electra' in the revised livery at Sydney Kingsford Smith Airport, January 1967. N359AC. 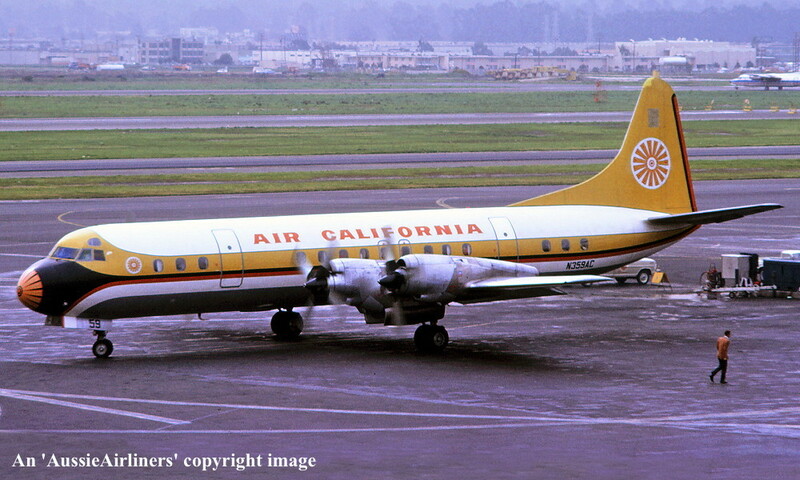 Air California - in the standard livery at San Francisco Airport, April 1968. 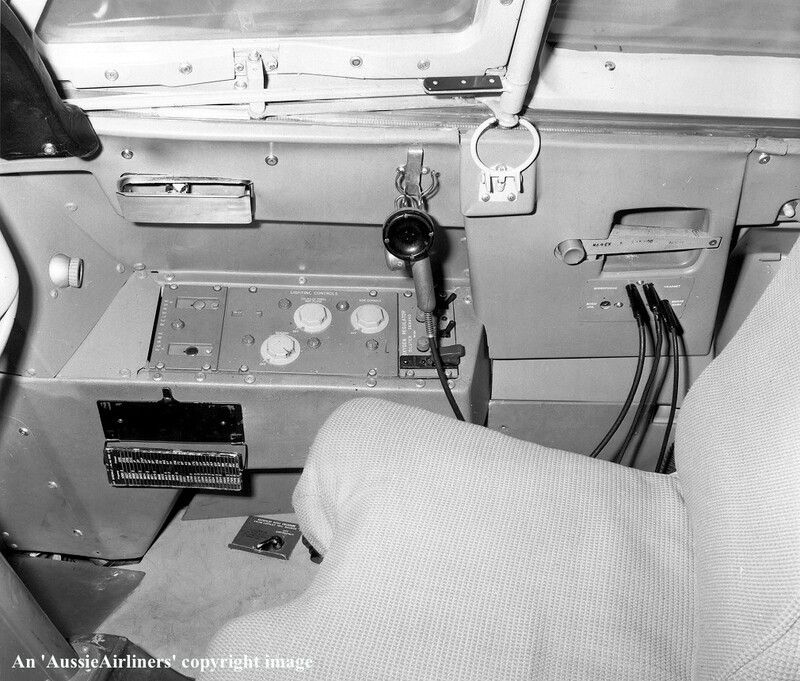 N359AC. 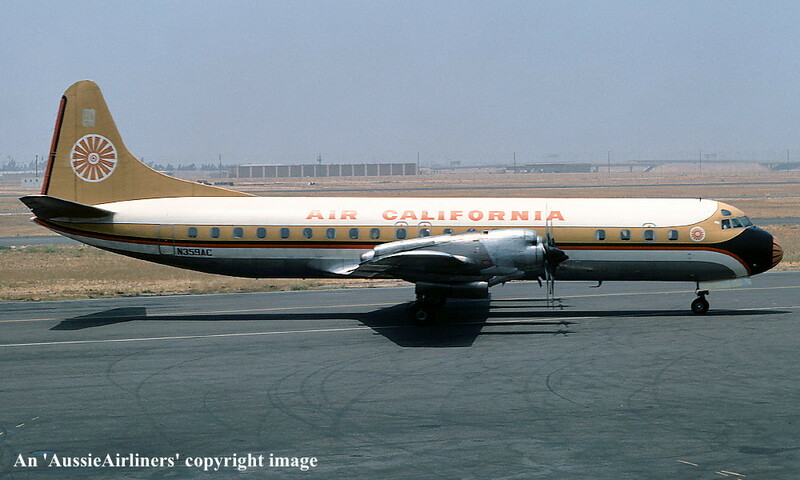 Air California - in the standard livery at Dallas Fort Worth Airport, June 1968. 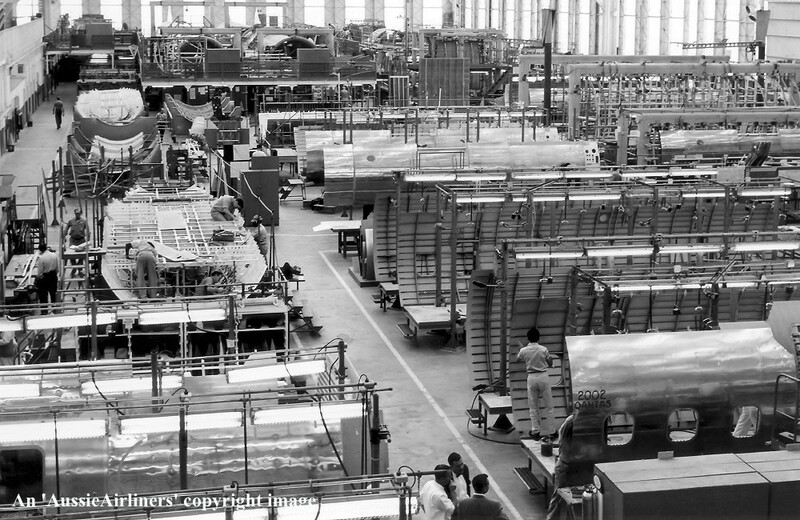 N359AC. 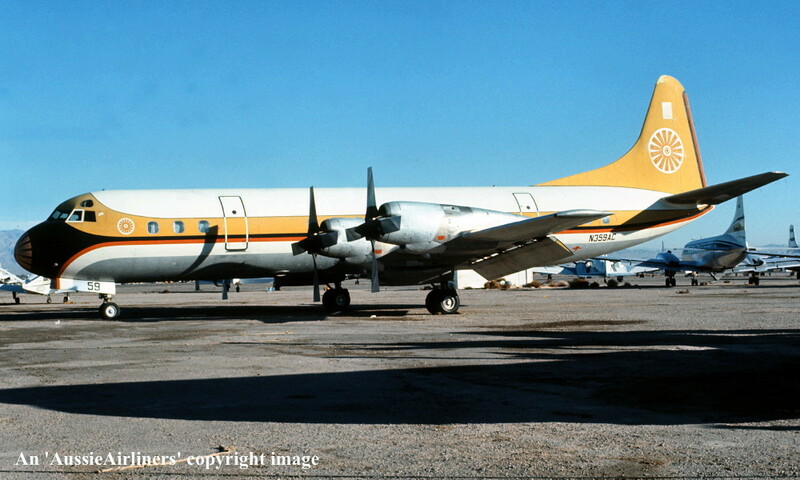 Air California - in the basic livery at Dallas Fort Worth Airport, December 1969. TI-LRM. 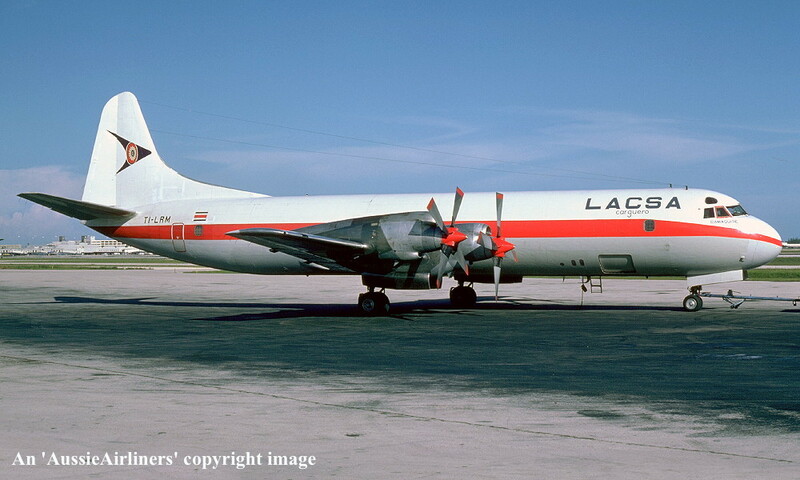 LACSA Carguero - 'Camaquire' in the standard livery at Miami Airport, July 1977. TI-LRM. 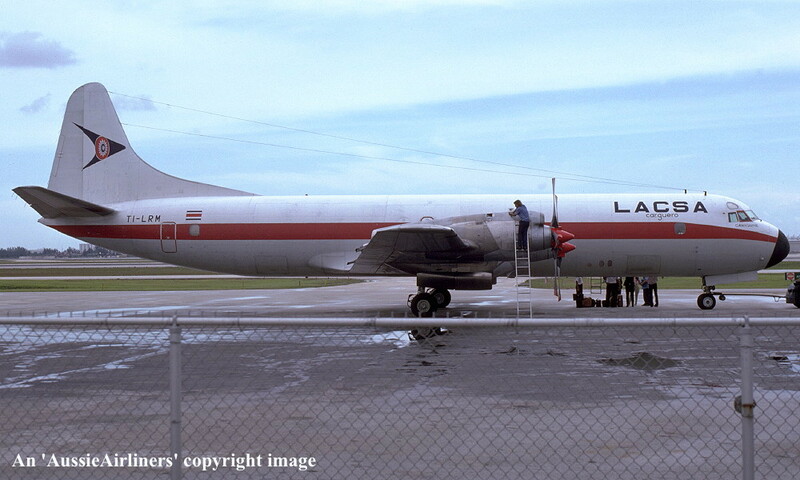 LACSA Carguero - 'Camaquire' in the standard livery at Miami Airport, May 1978. TI-LRM. 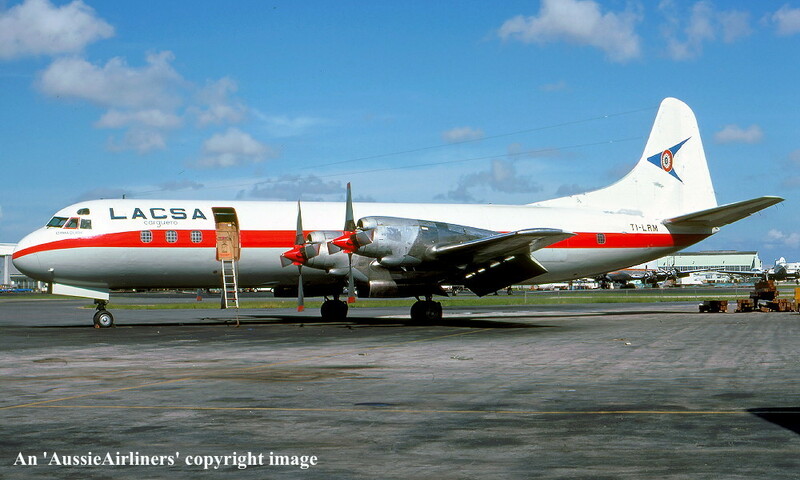 LACSA Carguero - 'Camaquire' in the standard livery at Miami Airport, August 1980. N359AC. 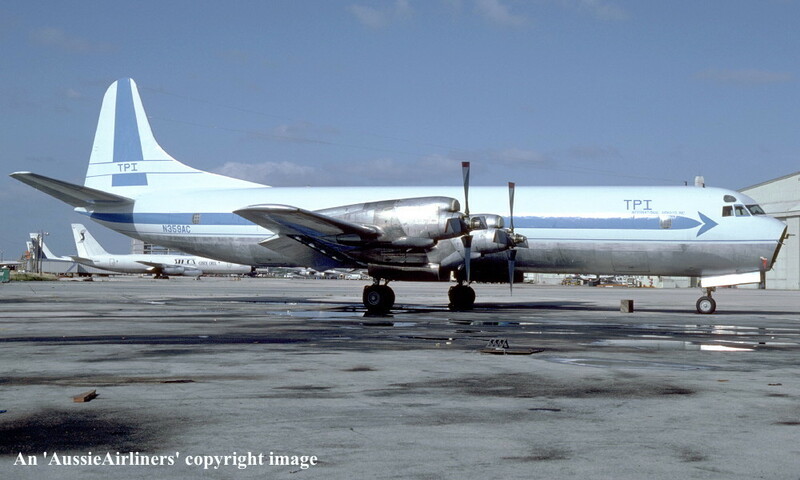 TPI International Airways - in the non-standard livery at Miami Airport, August 1984. N359AC. 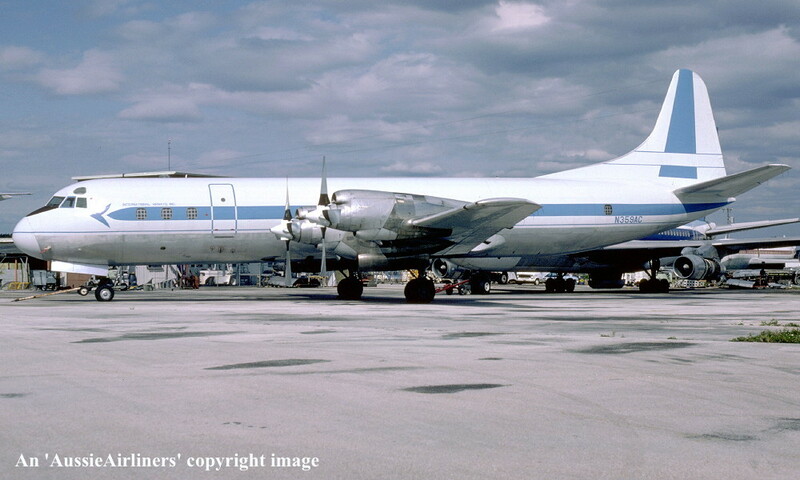 International Airways - in the non-standard livery at Miami Airport, October 1984. F-OGST. 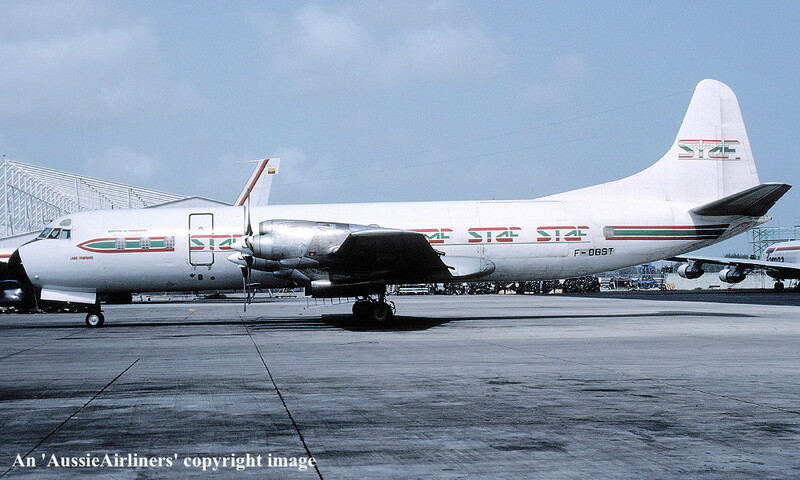 STAF - in the standard livery at an unknown airport, March 1987. F-OGST. 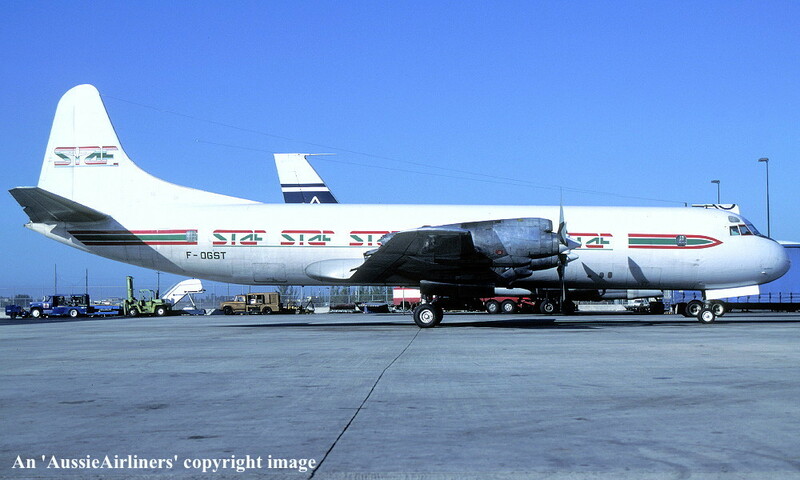 STAF - 'Laso Fabnano' in the standard livery at an unknown airport, December 1987. F-OGST. 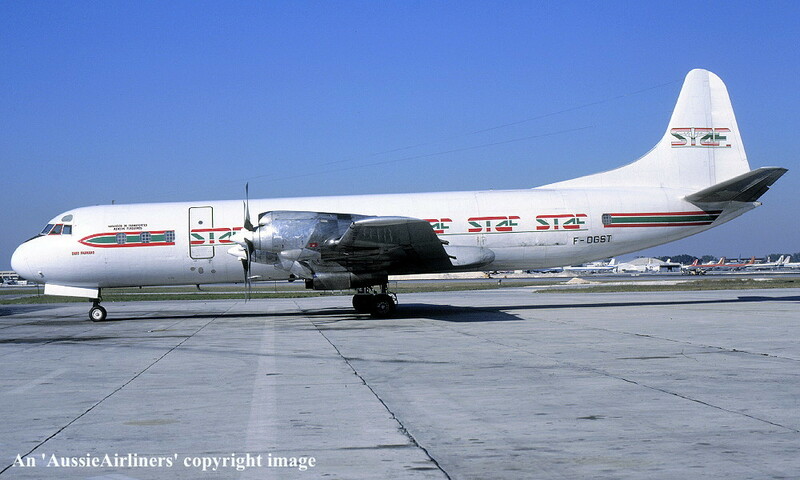 STAF - 'Laso Fabnano' in the standard livery at an unknown airport, January 1988. F-OGST. 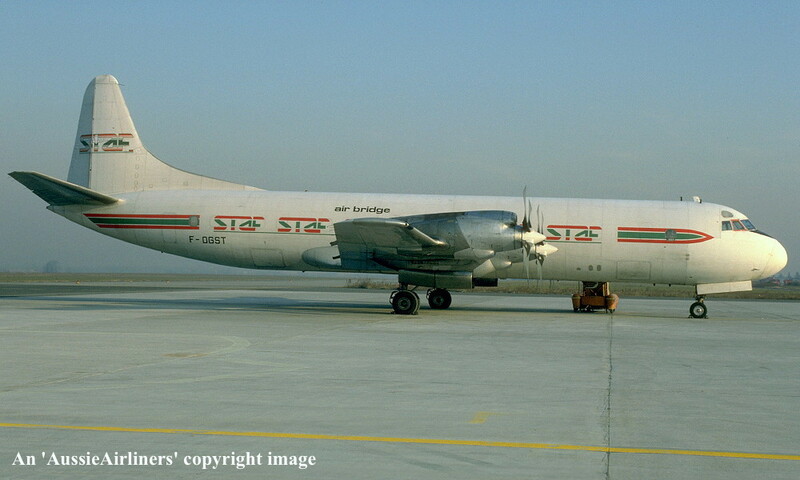 STAF - in the standard livery at an unknown airport, January 1989. F-OGST. 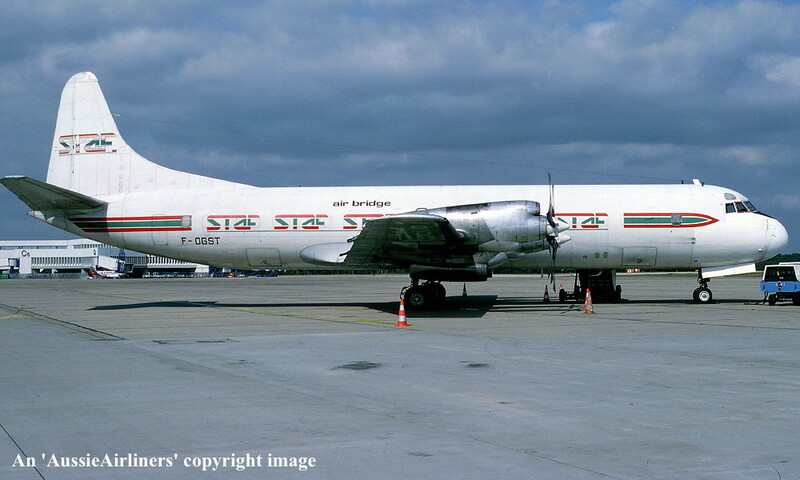 STAF - in the standard livery with additional 'Air Bridge' titles at an unknown airport, April 1991. F-OGST. 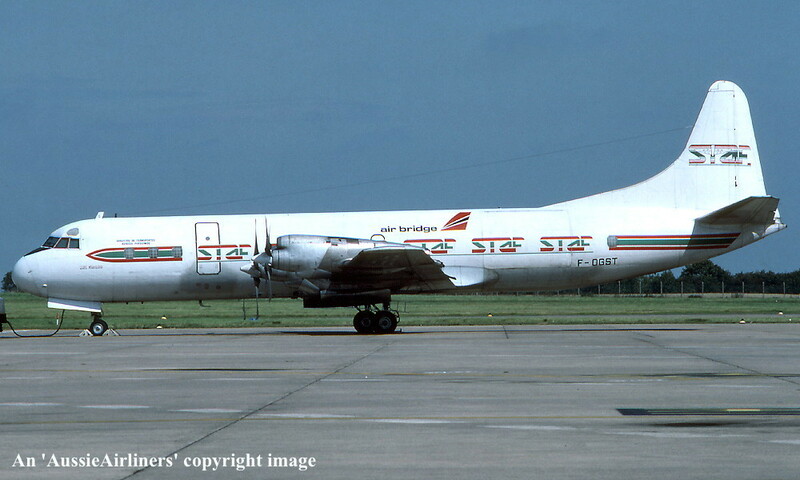 STAF - in the standard livery with additional 'Air Bridge' titles at an unknown airport, January 1992. F-OGST. 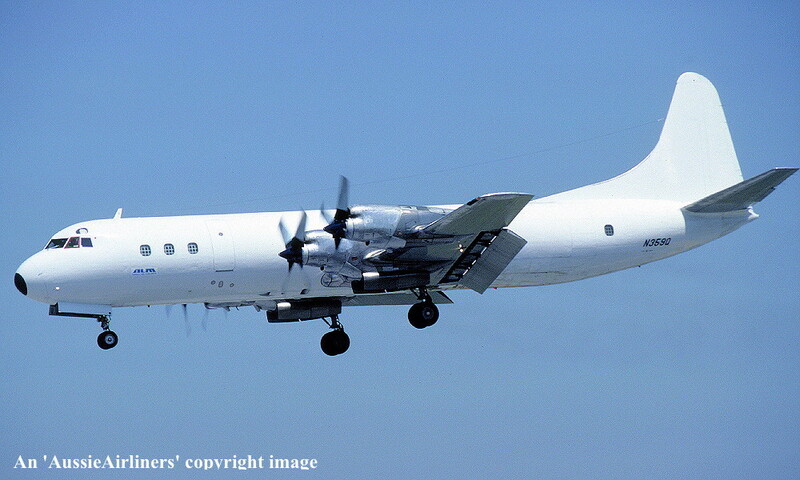 STAF - 'Laso Fabnano' in the standard livery with additional 'Air Bridge' titles at an unknown airport, July 1992. N359Q. 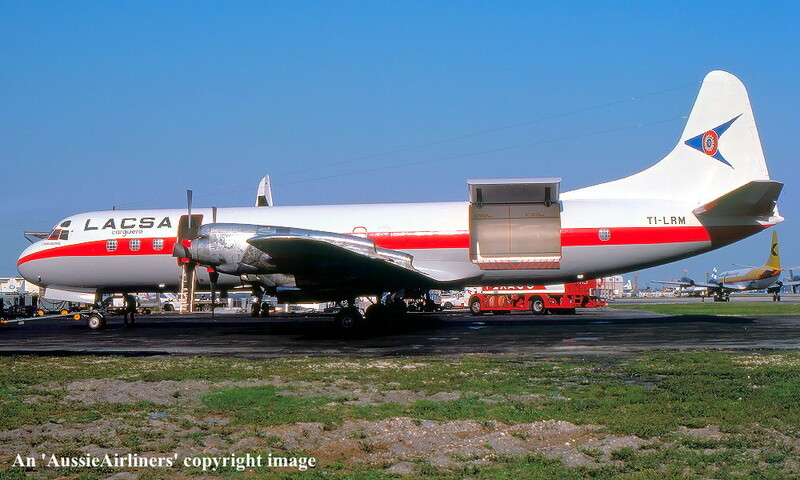 ALM - in the all-white livery at Miami Opa Locka Airport, February 1993. 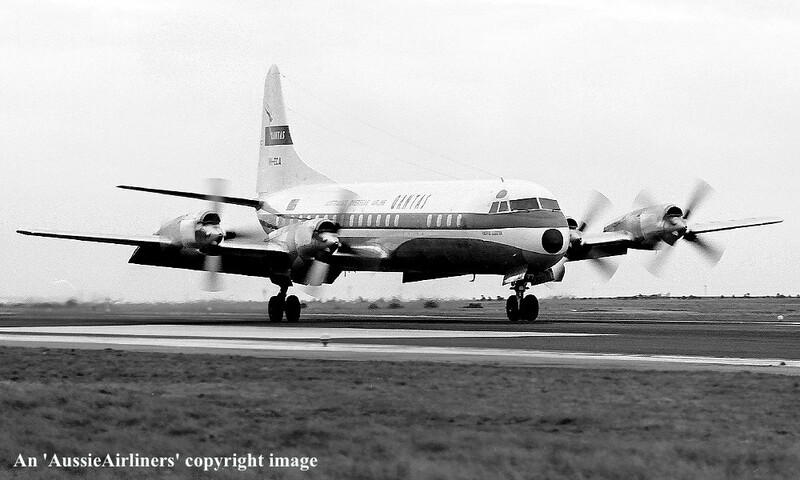 G-LOFA. 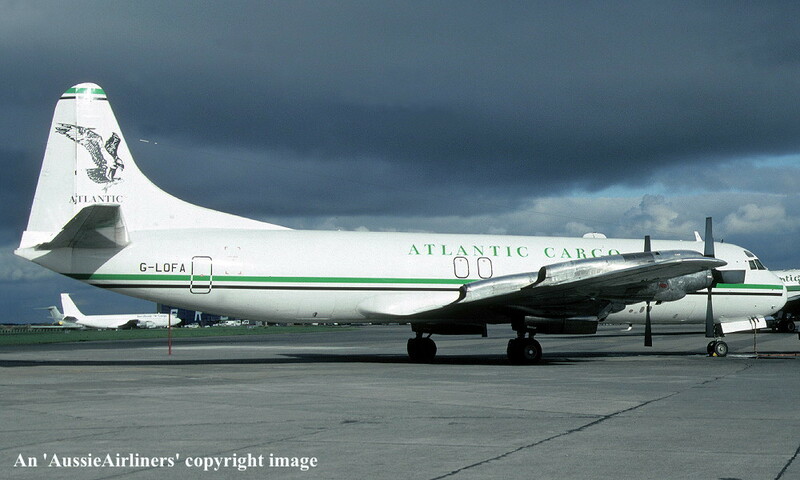 Atlantic Cargo - in the standard livery at an unknown airport, date unknown. G-LOFA. 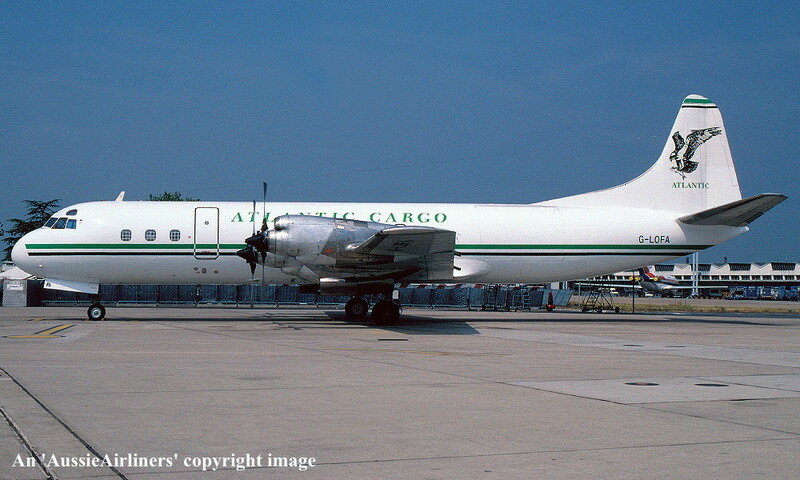 Atlantic Cargo - in the standard livery at an unknown airport, August 1994. G-LOFA. 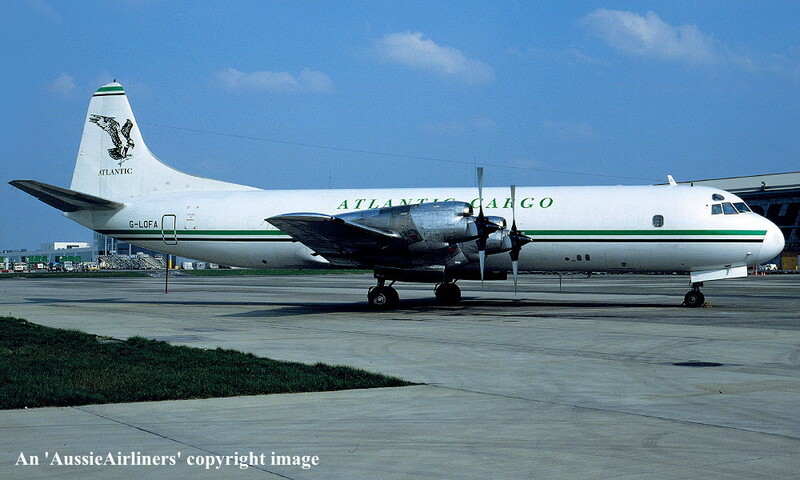 Atlantic Cargo - in the standard livery at an unknown airport, September 1995. 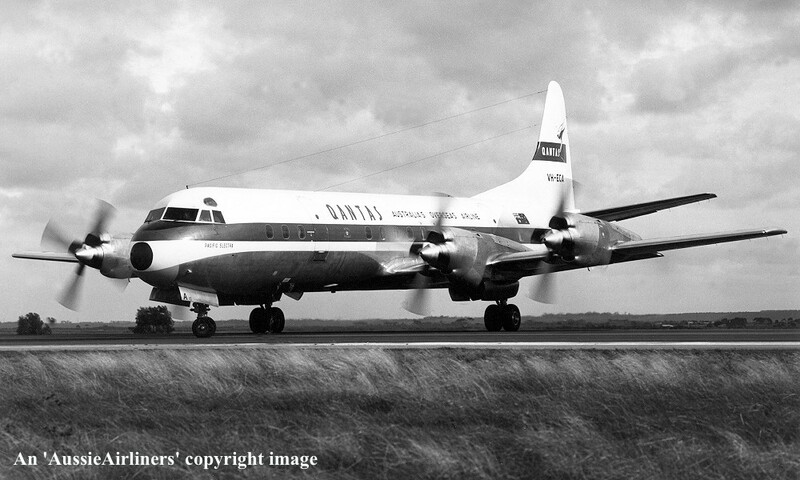 G-LOFA. 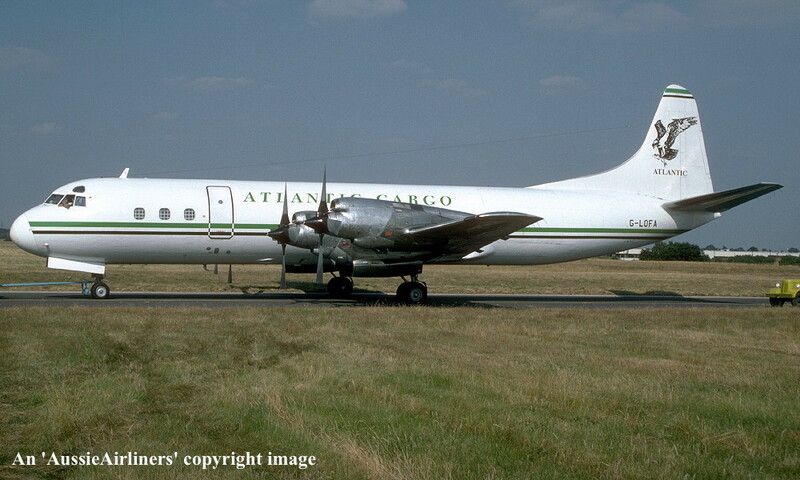 Atlantic Cargo - in the basic livery at Coventry Airport, June 1999.